Relive the Apostolic Pilgrimage to Jerusalem through photos documenting each day of the visit. Ecumenical Patriarch Bartholomew met today with Pope Francis on the Mount of Olives. At the site known as Viri Galilaei (Acts 1.11), the Patriarch and the Pontiff met for the third and final time during their joint pilgrimage to Jerusalem and the Holy Land. It marked the conclusion of an historical pilgrimage and fraternal encounter. Our meeting, another encounter of the Bishops of the Churches of Rome and Constantinople founded respectively by the two Brothers the Apostles Peter and Andrew, is a source of profound spiritual joy for us. It presents a providential occasion to reflect on the depth and the authenticity of our existing bonds, themselves the fruit of a grace-filled journey on which the Lord has guided us since that blessed day of fifty years ago. His All-Holiness Ecumenical Patriarch Bartholomew, spiritual leader of over 300 million Orthodox faithful worldwide, who is in Israel to meet with Pope Francis, today visited Bethlehem to venerate the sacred site of Christ’ s Birth and pray with its shrinking Christian population. All who descend into the inner chamber of the museum are free to walk away when they chose, and return to the sunlight. Such was not the case for these 1.5 million children whose lives were taken from them through hatred and unspeakable violence. It is our God-given mandate to bring discipleship to the world around us. And by discipleship, we mean the discipline bequeathed to us by our Lord to have compassion for one another and the natural environment. We are called and commanded to share with others the gifts that we have received and the joy that we have experienced on this Holy Mountain of Zion and in the Holy City of Jerusalem. This meal comes at the end of a long journey, which began for Your Holiness at the West and for our Modesty in the East. We have arrived in the place where East and West converge, to the roots of our very existence as Christians, the place where our Lord was born, taught, suffered the Cross, rose from the dead, ascended into heaven and sent the Holy Spirit to constitute His Church. Common Declaration made by Pope Paul VI and Patriarch Athenagoras, expressing their decision to remove from memory and from the midst of the Church the excommunications of 1054, 7 December 1965. The text of the joint Catholic-Orthodox declaration, approved by Pope Paul VI and Ecumenical Patriarch Athenagoras I of Constantinople, was read simultaneously (Dec. 7) at a public meeting of the ecumenical council in Rome and at a special ceremony in Istanbul. The declaration concerns the Catholic-Orthodox exchange of excommunications in 1054. 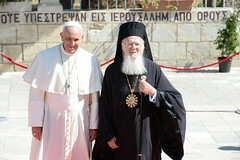 His All-Holiness Ecumenical Patriarch Bartholomew met today with Pope Francis on the Mount of Olives. At the site known as Viri Galilaei (Acts 1.11), the Patriarch and the Pontiff met for the third and final time during their joint pilgrimage to Jerusalem and the Holy Land. It marked the conclusion of an historical pilgrimage and fraternal encounter. Ecumenical Patriarch Bartholomew, at the invitation of the Government of Israel, planted an olive tree at the Grove of Nations on Mt. Herzel in Jerusalem. The invitation to plant a tree here is restricted to Presidents and Prime Ministers and the highest level official guests. Today's planting is a high honor afforded to the Ecumenical Patriarch and an acknowledgement of his environmental initiatives. Efi Stenzler, World Chairman of the Karen Kayemeth LeIsrael Jewish National Fund (KKL-JNF), received Ecumenical Patriarch Bartholomew at the event. His All-Holiness Ecumenical Patriarch Bartholomew meets with President of the Palestinian Authority Mahmoud Abbas. His All-Holiness Ecumenical Patriarch Bartholomew meets with President of Israel Shimon Peres. His All-Holiness Ecumenical Patriarch Bartholomew visits the Museum of Holocaust Art at the Yad Vashem Museum in Jerusalem. 05/26/14: Ecumenical Patriarch Bartholomew Receives Pope Francis at Little Galilee. His All-Holiness Ecumenical Patriarch Bartholomew receives Pope Francis at the summer residence of the Patriarchate of Jerusalem in Little Galilee.